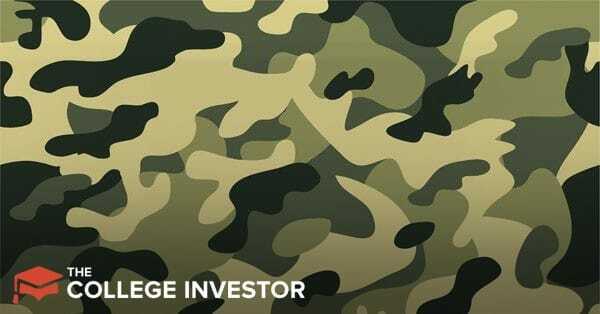 Being a service member gives you access to investment vehicles that civilians don't get. That's a great thing! But at the same time, it can be really confusing and hard to understand. Combine that with that fact that so many service members are young, haven't had much in the way of formal financial education, navigating the investment options to invest are tough. But at the same time, investing early is the key to wealth! I know quite a few retired service members who made it a point to start early - they wouldn't just rely on their retirement, but also would buy rental properties in areas where they were stationed, and invest in taxable accounts. After 20 years, they were set for life. 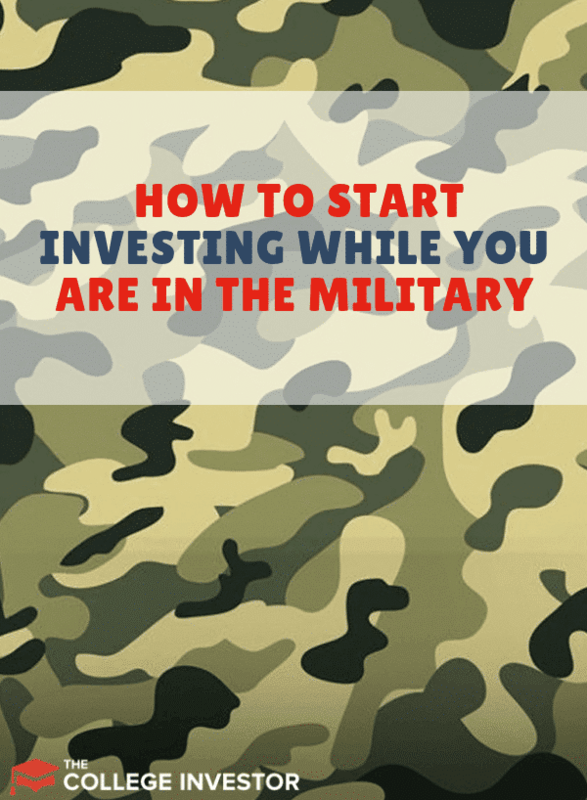 Here's what you need to know about getting started investing while in the military. Check out our other recent guide on Military Education and Student Loan Benefits if you're also looking for other ways to maximize your benefits in the military. Traditional TSP or Roth TSP? Before 2006, the military used a system called the uniformed services retirement system (also called the legacy system). Basically, after 20 years of service, service members receive a pension. Not everyone remains in the military for 20 years. This meant 81% of service members did not have a retirement when they walked away from the military. To ensure more service members receive retirement benefits, members who joined the military after 2006 but before January 1, 2018 were able to choose if they wanted to join the legacy retirement system or enroll in the Blended Retirement System (BRS). New military members enrolling after January 1, 2018 are automatically enrolled in the BRS. The result is that 85% of service members will receive a retirement benefit. You can find details about the annuity calculation here. Let’s look at the TSP option in more detail. The Thrift Savings Plan (TSP) is similar to the 401(k) plans offered by private corporations. The employee (service member) and employer (Department of Defense) can contribute to the plan. If you happen to leave the military, you can take your TSP savings with you. $16,500 if you are under the age of 50. $22,500 if you are over the age of 50. Contributions to the TSP are pre-tax. They come directly out of your paycheck. Withdrawals during retirement will be taxed on both contributions and earnings. Specific to military service members, contributions of tax-exempt combat zone pay are not taxed when withdrawn during retirement. However, earnings are taxed. The Roth TSP was introduced in 2012. It is similar to the Roth available for private citizens. Contributions into a Roth TSP are after-tax dollars. Retirement withdrawals and earnings are not taxed. Similar to the traditional TSP, contributions of tax-exempt combat zone pay are not taxed when withdrawn during retirement if the withdrawals are qualified. Additionally, earnings on contributions are not taxed. Like a regular Roth, qualified withdrawals are those made at least five years after opening the Roth TSP. You also must be at least 59.5 years of age, permanently disabled, or deceased. You can contribute to both types of retirement. Contributing to one does exclude contributing to the other. There are limits on how much you can contribute. The IRS places limits on how much you can contribute annually. For 2019, the limit is $19,000. To figure out how much to contribute to each account or just one, the TSP comparison calculator can help. You can find it here. It’s difficult to know what the future holds. In general, if you believe you’ll be in a higher tax bracket during retirement, the Roth TSP is a better option since withdrawals won’t be taxed. Here's a really in-depth guide about whether you should make Roth or Traditional contributions. Just as private companies sometimes match employee contributions, military retirement plans do the same. To receive contributions, you must be a FERS (Federal Employees Retirement System) or BRS member. Matching contributions start at 1% of your basic pay, whether or not you contribute to a retirement plan. This is free money even if you aren’t putting your own money into retirement. 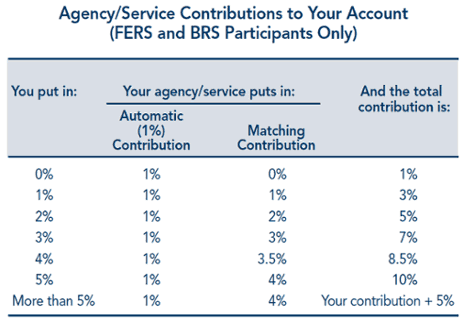 These free contributions are called Agency/Service Automatic (1%) Contributions. Once you start contributing to your retirement, contributions begin to increase. With a 1% contribution into your retirement, the Agency Matching Contribution kicks in. It matches 100% of your contribution up to 3% and phases down from there. Once you reach 5% contributions, matching maxes out at 4%. Keep in mind that you are still getting the Automatic (1%) Contribution. This means at a 5% contribution by you, the total contribution becomes (5% + 1% + 4%) 10%. The chart below shows how the contribution scales. The military offers a number of great retirement options. You just have to take advantage of them. The new BRS system was a welcomed change that allows far more service members to participate in retirement benefits. Increasing your contributions to 5% will ensure you are taking advantage of the full match the military has to offer.